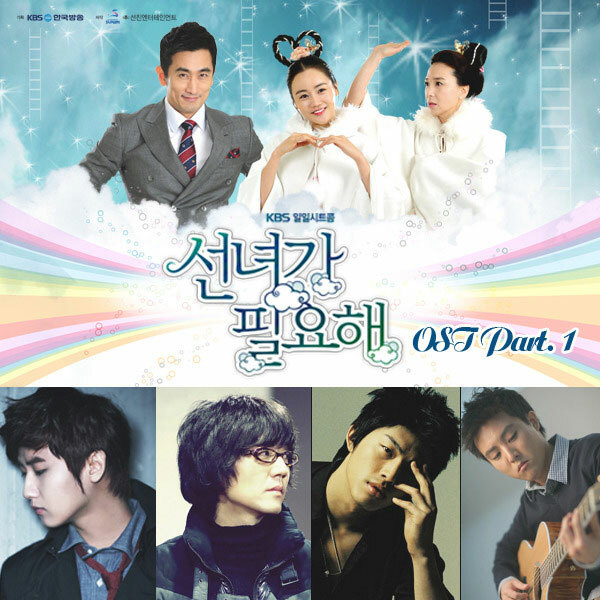 The Sent From Heaven OST part 1 album contains 4 different songs. The 1st song on the album of Sent From Heaven OST part 1 has the song title of “Love Song.” Love Song is sang by Heo Young Saeng (허영생). Listen to Love Song by Heo Young Saeng on YouTube. 네게 하고 싶은 그 말..네게 주고 싶은 그 말..
사랑해 널 사랑해..널 사랑해 언제나 그렇게..
네게 어울리는 그 말..매일 부르고픈 그 말..
내 가슴이 자꾸만 떨리는걸,,내 두뺨이 자꾸 빨개지는걸..
난 너만보면… 너만 바라보면.. 너만 바라보면..
내 눈빛이 자꾸 흔들리는걸..내 입술이 자꾸만 마르는걸..
내가 듣고싶은 그말..항상 꿈꿔왔던 그말..
나의 아침을 깨우는..사탕보다 달콤한 말..
너하나면 아픔도 비켜가고..너하나면 슬픔도 달아나고..
ne-ge ha-go shipeun geu mal..ne-ge ju-go shipeun geu mal..
sarang-hae neol sarang-hae..neol sarang-hae eonjena keureohke..
ne-ge eou-llineun geu mal..mae-il bureu-gopeun geu mal..
nae gaseumi jakkuman tteollineunkeol,,nae duppyami jakku ppal-kaejineunkeol..
nan neomanbomyeon… neoman parabomyeon.. neoman parabomyeon..
nae nunbichi jakku heunteu-llineunkeol..nae iptu-ri jakkuman mareuneunkeol..
nae-ga deudkoshipeun geumal..hangsang kkumkkwowaht-deon geumal..
naye achimeul kka-euneun..satangboda tal-gomhan mal..
neohanamyeon apeumdo bikyeo-ga-go..neohanamyeon seulpeumdo darana-go..
You’re more beautiful than flower, my angel, oh..
Wake me up in the morning.. Words that sweeter than candy..
With only you, pain goes away.. With only you, sadness flees..